The Young Crawford Group is a new student organization of the School of Agricultural Science of the University of Tasmania (UTAS), sponsored by the Crawford Fund. It will organise monthly meetings with international researchers on topics including international research and development in agriculture, fisheries, forestry and natural resources. Students coming to the Young Crawford Group meetings have an opportunity to discuss with professionals and to discover about their work in developing countries. 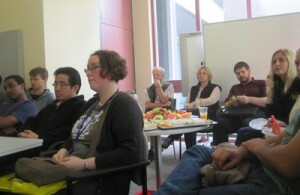 The first Young Crawford Group meeting was held on Tuesday 6th of March 2012, with approximately 35 people attending, of which most were undergraduate students from the School of Agricultural Science. It was also excellent that a number of exchange students, Master students, PhD candidates and TIA staff members showed their support for the Young Crawford Group by attending our first meeting. Dr Neville Mendham, Former Senior Lecturer in Agronomy and Coordinator of the Tasmania Crawford Fund Program gave an introductory speech about the Crawford Fund. He explained why it was founded and what the main objectives are, and emphasised that the group is trying to reach more and more young people. Neville then talked about the annual Parliamentary Conference in Canberra, which is held to facilitate the discussion of burning issues in the field of International Agricultural Research. Josh Scandrett and Hannah Thompson attended this conference last year thanks to a Crawford Fund scholarship. Dr David Parsons, Research Fellow at the School of Agricultural Science, UTAS, also said a few words before the presentation. He said that he hopes that the Young Crawford Group will be able to provide students with information on current and future opportunities to work in international agriculture, whether it is for their Honours, Master or PhD projects. Josh Scandrett (left) started his speech by explaining the Australian Youth Ambassadors for Development (AYAD) Program, which supports 18-30 year old volunteers in 12-month posts at international agricultural research centres in developing countries. He stated that the programs are based on topics such as Rural Development, Gender, Health, Trade and Business… As an AYAD volunteer he joined a project coordinated by ACIAR and UTAS, working on the improvement of pasture species that have a better tolerance to water logging and salinity. He spent 9 months in Qui Nhon, central coast of Vietnam in 2009. 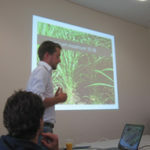 When he arrived the project had been going for one year in 3 provinces, and was based on on-farm research. He explained the project and his findings, and additionally described Vietnam as a fantastic place to live. The main constraints that he encountered during his time in Vietnam were the differences between what he has learned and the reality of working in a country like Vietnam: logistical problems, cultural differences, acceptance of the new forages by farmers. He expressed the need for building good relationships between international researchers and local farmers. He also explained that one shouldn’t underestimate the knowledge of local people. At the end of his presentation, he showed some pictures of his trip to Vietnam and told some stories on what happened to him there. During the discussion, Josh was asked what he thought he had brought to the project in exchange for the knowledge he had acquired of the Vietnamese farmers practices. He answered that while he learned a lot about Vietnam farming and culture, the main things he brought were agronomic and scientific skills. He particularly believes that the process of understanding and performing scientific methods, being able to design a scientific procedure and to produce and analyse scientific data that can generate statistical results were crucial for his success in Vietnam. To a question on his main lessons learned from this experience, he said that thanks to his placement he now knows more about how a project runs and operates in the field, and how to be careful not to offend anyone. Josh graduated a Bachelor Degree with Honours in Soil Sciences and is currently working in Hobart for a geotech consultancy firm. He is considering doing a Master or PhD in international agriculture. For him, it doesn’t have to be a career-long commitment, and there are plenty of opportunities to do assignments, including the AYAD Program and some NGOs or UN agencies, like UNHCR. At the end of the event, a survey was sent to participants in order to get their feedback and improve following meetings. So far, 15 people have answered and all of them were satisfied with this first meeting! A Facebook page was also created for the Young Crawford Group. If you missed the meeting, you can read about Joshua’s experience in the June-September 2011 AYAD Exchange magazine.